Kodiak Bear and Blacktails - by Denny Sturgis Jr. I glanced at Dan, my hunting partner, fumbling shells into his .44 mag revolver. I wondered if he could hit anything with it. The hill-lined coast looked green and manicured, like a golf course, in this treeless area of Kodiak Island. Jeff motored into a bay with a shale beach, dropped anchor and lowered the raft. We loaded the raft and floated toward shore. Dan grinned at me and I smiled back. It felt good to be hunting. After landing, Jeff laid out the game plan. We would follow a game trail up the backbone ridge that started at the beach. Being August, the Sitka blacktails would be high in alpine meadows. Half way up the first emerald hill, realization set in. Not at all like a golf course. The steep grade and wet brush, up to head high, laced with nasty thorns made for a good workout. The uneven footing hidden below the thick growth could be treacherous. We scrambled upward, thankful to be wearing stiff, waterproof leather boots. Stopping and glassing occasionally, we spotted deer in the distance. Two hours later, we topped out, removed packs and glassed. Jeff pointed out several bucks with his spotting scope. Careful not to skyline, we crawled to the lip and glassed the valley below. A three by three grazed two hundred yards away. With the generous bag limit in mind, we decided to try a stalk. 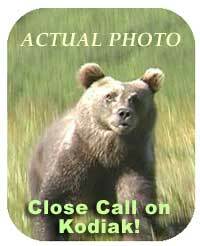 I jumped at the chance to hunt and film on Kodiak earlier in the year when Dan invited me. After reading numerous articles and books about hunting on Kodiak, one point stood out. In each story the island seemed to fascinate the author and tug at his heart to return. We would stay in a lodge in Old Harbor on the southeast side of Kodiak. Jeff Petterson, a local charter captain and bowhunter would take us hunting from his 24’ boat. Keeping the crest of a ridge between us and our quarry we circled, closing the gap and putting the light wind in our faces. Dan located a position to record the action. The blue bird day felt pleasant, but quiet. To stalk within effective shooting range I had to sneak through an alder patch. I did my best, but when I popped my head out the other side the Buck stood a hundred yards away looking my direction. Dan recorded some footage so the stalk wasn’t a total loss. We glassed new country while enjoying a late lunch. We spotted two bucks quite a ways out. An exceptional rack crowned one of the deer. Distance is hard to determine for a flatland Michigan boy. I couldn’t believe it took almost two hours to get above the bucks. We decided to skip the video and each try a different approach with our limited time. Jeff, also a traditional bowhunter, was anxious to put his longbow to the test. The bucks fed on a narrow bench halfway up a large hill. Dan planned to drop down through a saddle and approach from above. Jeff and I would ease down different sides and move in side hill. We split like a wolf pack. I circled and peeked over a rock outcropping. The two bucks continued feeding. Dan was out of sight from this location. Another nice, bedded buck watched Jeff easing along. Pulling the camera from my pack I recorded a few minutes. After repacking the camera, I descended in a grassy gully concealing my movement. The steep grade prevented silent walking. I discovered sliding on my rear was a quieter option. A velvet antler appeared floating above the salmon berry bushes. I snatched the bow from my lap and nocked an arrow. The smaller buck stopped fifteen yards below me, wide open. He glanced my way and then toward the ocean. A quick check showed no sign of the larger buck. On cue, I aimed and anchored. Something went wrong on release. The arrow flew low and right striking the deer low and forward. He charged into an alder patch. I jumped up, shed the pack and nocked another arrow. 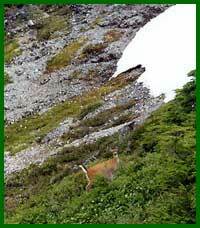 The buck appeared on a grassy knob above the alders about sixty yards away. While I wouldn’t consider a shot at this distance on a healthy animal, wounded game is another story. I concentrated on the buck’s ribs as he stood quartering away, drew and released. The arrow arced out into one of those lucky shots you never forget. After a nearly perfect entrance, the arrow continued spiraling toward the ocean. The blacktail pitched into the alders below. I stumbled to the knob and spotted the expired buck. While I stood there another buck walked right by. Even with multiple tags, I passed; we had plenty of work already. Dan and Jeff showed up. They hadn’t seen the big buck either. He’d vanished, a trait common to the big whitetails at home. We took pictures, videoed and boned out all edible meat. After packing up, we descended to the beach below. I lost count of how many times we stumbled and fell. Back at the lodge in Old Harbor we feasted on fresh halibut, crab and silver salmon. After a steam bath in Jeff’s Bonya and a cold drink we planned our next day. The week passed quickly. We lost a few days to rain and with filming and fishing included in the schedule our final day to hunt came too soon. Dan had yet to shoot a buck. I told him I’d leave my bow and be his camera boy all day. Jeff decided to climb the hill behind the lodge for our final hunt. We located a buck on top. After skirting around some does, we moved in. I set up video from a knoll overlooking the high valley. Jeff approached from below and Dan from above. Before Jeff reached the buck it began walking up a chute toward Dan. Dan couldn’t see the deer from his position. I desperately tried to signal Dan from long range. The buck continued walking and feeding toward me. Finally, I saw Dan peering at me through his binoculars. Looking back through my optics I pointed to the buck now directly below. Dan signaled thumbs up and dropped into a gully separating him from the deer. I continued filming the buck. The battery warning light came on the instant Dan’s head appeared on the horizon, every videotographer’s worst fear. I quit filming to conserve power. Did I have time to switch batteries? I wondered. No, Dan prepared to shoot. I punched the record button. Dan lowered his bow and started easing closer and I stopped recording again praying the battery would last. Dan started drawing his bow and I pushed the record just in time to capture the arrow in flight. The buck wheeled on impact. I panned back to Dan as he shot again. The battery died as the deer vanished over a rise. We regrouped and decided to wait a bit before trailing the hard hit blacktail. Figuring the buck was down in the large alder patch below, Jeff stayed high to glass while Dan and I took up the trail. We entered a small clearing. I remembered I had to switch batteries, check film and the lens. Plus, I needed a nature break. Dan said he wanted to check out some likely looking alders ahead. I finished and started repacking the camera. A swishing sound caused me to glance up. Thirty yards away a Kodiak bear walked toward me through the tall grass. I froze in kneeling position hoping he wouldn’t see or smell me. I mentally assessed the situation, no gun, no trees, no bow, no pepper spray and no brains. I did have a fairly heavy tripod though. 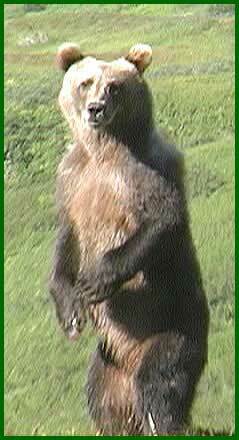 At twenty-five yards the bear noticed me, raised to his hind legs and stared. 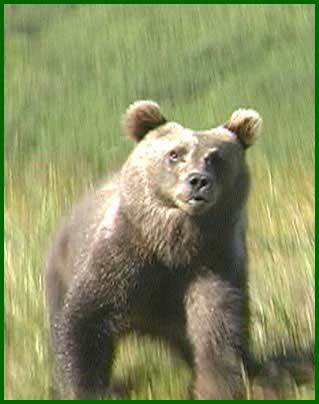 I remembered Jeff’s advice: If you see a bear stand your ground and look big, don’t run. I stood up grabbing the camera and started recording. The bear looked for a few seconds, dropped to all fours and cantered toward me. “Hey Dan, I got a bear after me,” I yelled. Filming my own demise didn’t seem so cool; I bent over and grabbed the tripod for defense. No sign of Dan. The bear put on the skids a fifteen yards, stood and stared again. I peered at him through the video camera again. The bear dropped down and ran towards Dan’s location. “Dan, there’s a bear coming,” I shouted. The bear spun at the sound of my voice and gave me another pig-eyed look. Then he turned and loped into the alders. “Coming your way,” I yelled. My heart was beating like a flicker’s beak on a dead cottonwood limb. I took a deep breath and exhaled slowly while giving thanks. Dan burst from the alders and Jeff descended to our location. After putting distance between us and the bear’s lunch we took a break and I played back the bear footage for Dan. Pretty sloppy, but considering the circumstances not that bad. The sky seemed a little bluer and the grass a little greener as we continued our last day of hunting. Looking out over the cloud shrouded ridges on our departure flight, I knew why the island fascinated so many hunters. I prayed I could return and enjoy closer shots and longer calls next time.